This year the Proper Bostonian Quilters Guild has been working on a mystery quilt which is a sampler of star blocks. There have been lots of stitch and flip patches in the blocks. Those stitch and flip units have "waste" triangle units which are really ready-made half square triangle blocks! I decided to make those little triangles into a couple of doll quilts. Here is the first one. 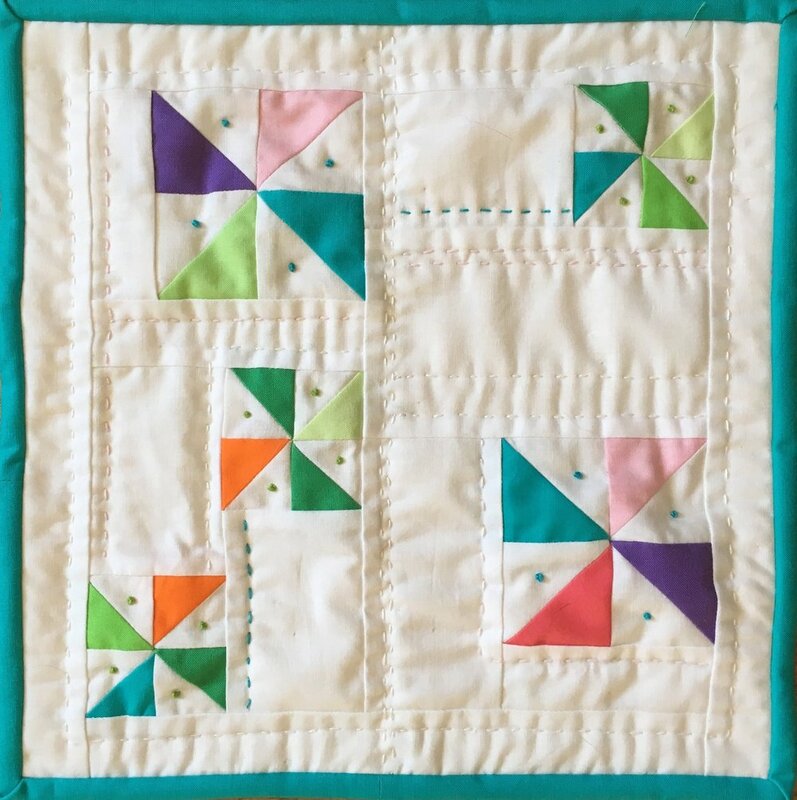 The little pinwheels finish at 2 inches square and the larger ones at 3 inches square. It's quilted with Big Stitch Quilting using #8 Perle cotton thread and there are French knots in the pinwheels. When I first started quilting and was using a lot of applique, I added details with embroidery. Now that embroidery is making a big come back, I can see using it, sparingly, to add a little pop to a quilt. I've been adding dots to lots of my drawings so I decided it would be fun to put some little dots in this doll quilt! This is a little doll quilt--a size chosen to be used with my Baby Waldorf Doll. Doesn't Lucy Birch look comfy under the quilt? I have enough left little half square triangles to make one more quilt about this size. The design is done and it's ready to sew, so I'll share it soon!